We are offering Steel Fibresto our clients. We are offering our client an excellent quality range of stainless steel fiber. Stainless steel fiber SS 304 and SS 310 non-magnetic for used in refractory linings, bricks and walls. High temperature resistance. For decades the use of steel meshes was considered to be the only option for concrete reinforcement. The disadvantages of costly and time-consuming preparatory work, often also the excessive cracking of conventionally reinforced concrete, was simply accepted. Our range of Stainless Steel fibres are highly appreciated in the industry & find their application in refractories enhancing their properties. 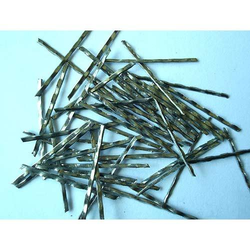 Owing to the vast acquaintance, our firm is competent to present Steel Glued Fiber. Our customers can avail this product as per their requirements. Dia 0.75 mm confirming to ASTM A 820 Type I standard EN14889 1 Standard, Length 60 mm, Aspect Ratio 80, Glued . Minimum order 1 metric Ton. Steel Fibre Reinforced Shotcrete (SFRS) is shotcrete (spray concrete) with steel fibres added. It has higher tensile strength than un-reinforced shotcrete and is quicker to apply than weldmesh reinforcement. It has often been used for tunnels.